With their announcement of the B4420 for metro base stations, Freescale is filling in their product line between the previously released PSC913X family for femto and pico cells, and the B4860 for macro cells, which they announced at Mobile World Congress in February. Stephen Turnbull, Marketing Manager for the Wireless Access Division at Freescale, says that the common architecture, and software compatibility across the product line, are attractive features for operators as they plan the addition of smaller cells in urban areas with dense usage. Freescale specs out metrocells as providing coverage of less than 5 Kilometers (approximately 3 miles), with RF power from 1W to 5W, and capacity of approximately 200 users. Turnbull says that the B4420 can support up to 256 users, with one or two 20 MHz sectors of LTE, at up to 600 Mbps aggregated data rate. Relay mode is also suported in the B4420. 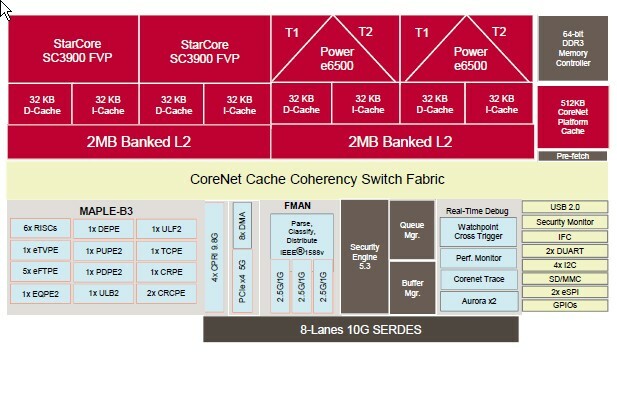 The B4420 integrates two dual-threaded 64-bit Power Architecture e6500 processor cores running at 1.6 GHz, with two StarCore SC3900 Flexible Vector Processor (FVP) DSP cores running at 1.2 GHz. The Multi-Accelerator Platform Engine for Baseband (MAPLE-B) provides Layer-1 acceleration, and supports LTE, LTE-Advanced (compliant with the 3rd Generation Partnership Project's (3GPP) Release 10) and HSPA standards. The 128b AltiVec Single-Instruction Multiple-Data (SIMD) vector processor provides accelerators for Layer-2 scheduling. The Frame Manager (FMAN) performs autonomous packet parsing and classification. This is essentially a scaled down version of the macro cell B4860, which integrates four of the e6500s with three sets of dual StarCore SC3900 DSP cores. Interfaces on the B4420 include four Common Public Radio Interface (CPRI) v4.2 antenna connections, four PCIe v2.0, and three 1/2.5 GBe ports. The PCIe interfaces will provide an option for connection to WiFi chipsets, to provide offload or backhaul, since wired backhaul to most metro cell installations will be less convenient, says Turnbull. Freescale is manufacturing the B4420 in the same 28nm process as the B4860, and the devices are also pin-compatible. The company plans to offer samples of QorIQ Qonverge B4420 devices in Q3 2012.